"I think it's amazing, but I'm kind of annoyed, you know?" 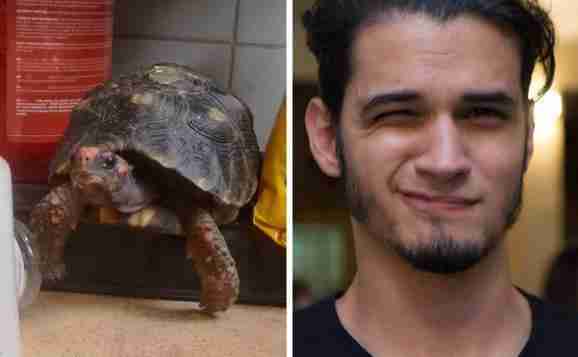 Sure, Odette the tortoise enjoys hanging out with her owner, Thomás Tavares — but just because they're best friends, that doesn't mean she has to invite him along for everything she does, all of the time, right? 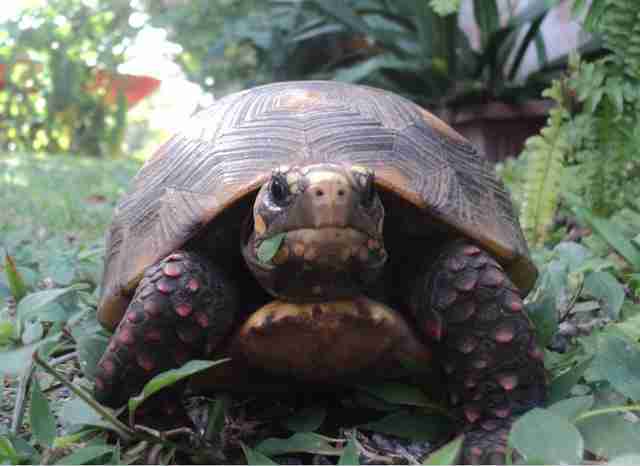 Normally, the 4-year-old red-footed tortoise is given free range to roam about the home and garden she shares with Thomás in Rio de Janeiro, Brazil. With that liberty, Odette has been known to tuck away in some hidden place to get away from her housemate for a while, but she always appears after a day or two to grab a bite. At least, that's how it usually happens (and sometimes it's from the dog's bowl). 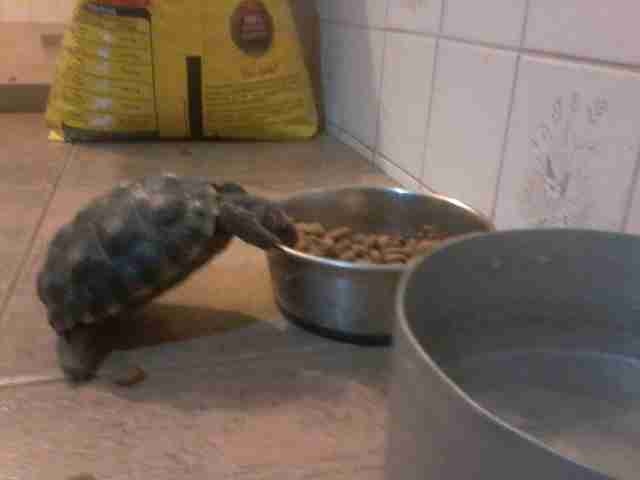 Late last month, Thomás was devastated after his dear tortoise disappeared and failed to re-emerge after several days. Then several days turned into several weeks, with still no sight of her. Was she injured somewhere? Had she escaped and gotten lost? Thomás had no idea and was worried sick. Odette, meanwhile, was actually having the time of her life without him — a fact he soon discovered. "She was gone for three weeks, until last weekend," Thomás told The Dodo. "I was leaving home with my mother when I saw her crossing the street back toward our house. Then I noticed there was something on her shell." 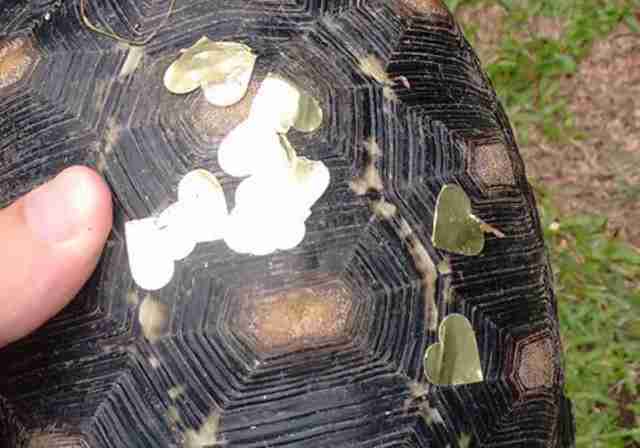 Inexplicably, Odette's shell was now covered in stickers — shiny, gold, heart-shaped stickers. Thomás was thrilled she was back, but was totally perplexed about where it was she'd been. "I joked that she had been off at Carnaval and was just getting home," he said. The truth, however, wasn't so far off. Not long after Thomás shared the photo above on Facebook — with folks posting theories about Odette's adventures — he was contacted by Bia Ruffoni, a friend of his who lives nearby. Turns out, she could explain exactly where the stickers came from. 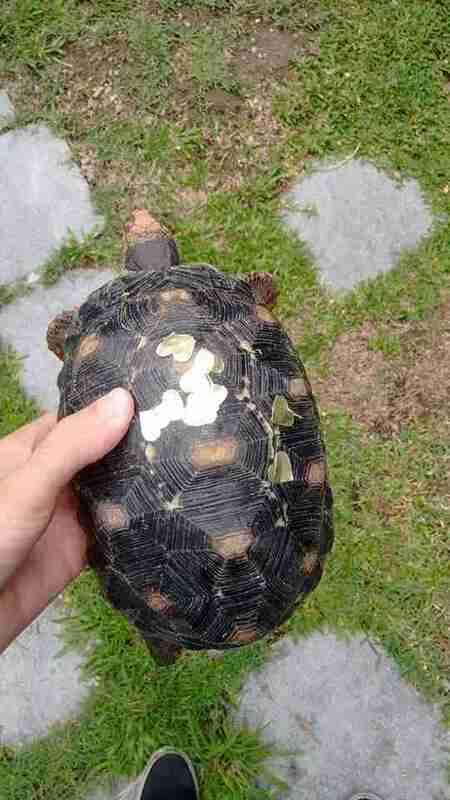 "We were preparing the house for my niece's 2nd birthday party, and suddenly we see there's a tortoise in the yard. The gate must have been open, and she strolled right in," Bia told The Dodo. "My niece got so excited and called everyone in to see. It was sensational." That's when the little girl decided to adorn the surprise visitor's shell with some decorations. "She said, 'Beautiful turtle — beautiful!'" Bia recalled. Admittedly, tortoises like Odette are beautiful (even without the stickers). Even though it probably took Odette a long time to get to the party, she apparently thought it best to get a head start for the journey back home, lest Thomás get too worried about her. Bia says that as more guests began to arrive, and with her niece distracted, the tortoise was gone as mysteriously as she had arrived. Learning that Odette wasn't really lost, but rather out partying, left Thomás feeling very impressed, and perhaps a little left out. "I think it's amazing, but I'm kind of annoyed, you know?" he said. "She could invite me along for the next adventure. I hate staying at home." "Thomás is always welcome. Now, Odette is too!"